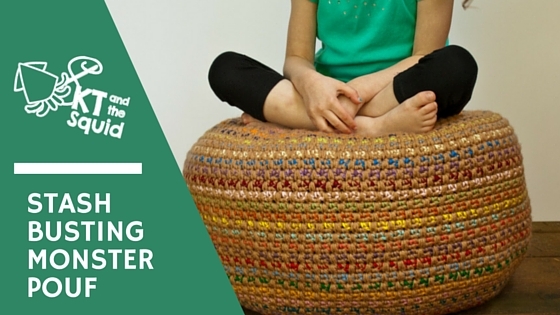 View cart “Stashbusting Monster Pouf – Crochet Pattern” has been added to your cart. This fun Monster Pouf was once a paid pattern an is now FREE! You can view this pattern below for free but if you like to print your patterns you can purchase a PDF to print free of ads. Worsted Weight Yarn (approx. 1810 total yards). Most of the yarn used in the sample is Red Heart Super Saver. *You will use 2 strands held together. *Keep in mind the bottom comes is left open so whatever you put in you can always take out. For the pouf pictured I used 4 throws/afghans. Spike single crochet (Ssc): Insert your hook into the stitch 1 row below, pull up a loop, yarn over pull through all loops on hook. Single Crochet 2 Together (sc2tog): Insert you hook into the first st indicated, pull up a loop, insert your hook into the next st, pull up a loop, yarn over, pull through both loops on hook. You will use 2 strands of yarn held together. If you do not know how to make a magic loop I have a video here. This pouf is worked in two pieces (pouf and the bottom) in the round. For the main color (MC) I used 2 strands of brown, For the contrasting color (CC) I used 1 strand of the MC and one strand of a CC. You will change colors every round. At the end of each round join the last st of the round to the first st of the round with the new color and work the first stitch into the first st of the last round. For the CC I picked random colors as I went. Do not fasten off your MC when changing colors. *TIP: Try to keep fairly loose tension as you work. You hands will thank you later! *Use 2 strands of yarn held together. Repeat rounds 1-2, 19 more times (or until your desired height). Repeat round 1, one more time. Repeat rounds 1-20 of the increases, fasten off. Stuff your pouf with the stuffing of your choice. I found it was easier to use a few smaller blankets than one large blanket. You may find it’s a bit lumpy at first but after it’s been sat on (or jumped on by very excited children) the lumps will work themselves out. Slip the bottom into the opening. To wash: take the bottom out and remove stuffing.